2016 SKYWARN Recognition Day is a wrap. The popular annual on-the-air event celebrates the long, mutually beneficial relationship between weather forecasters and radio amateurs/spotters. From a banner on the Melbourne, Florida, National Weather Service website: "Another SKYWARN Recognition Day is in the record books! Thank you to all of our Amateur Radio volunteers who made this another successful event! This page will be updated with pictures and this year's stats soon." We will publish stats and anecdotes from this year's SRD as they come in. Watch for February 2017 QST coverage in the Public Service column, including reports of activity at the Taunton, Massachusetts NWS facility and operation from W1AW. A new version of the IARU Emergency Telecommunications Guide (September 1, 2016) is available here. A Rural County ARES Group Planned for Hurricane Matthew -- In preparation for Hurricane Matthew's arrival on the Florida peninsula in October, Gilchrist County (a rural county northwest of Gainesville) EC John Greiner, KJ4YPZ, worked at the county EOC with a good plan for his ARES ops: "to monitor the 147.285 MHz repeater in [the farming town of] Bell, and when conditions warranted, I would put out a call every hour at the bottom of the hour (30 minutes past the hour) for any emergency traffic. If stations were on emergency power, they could call at that time and save power the rest of the hour. At the top of the hour (on the hour) I would change frequency to the 146.82 MHz repeater to confer with neighboring Alachua county ARES and EOC where I would remain for 10 minutes to relay and pass traffic/info as needed." Greiner planned for ARES to "monitor in place." If shelters were opened, Greiner would send two radio operators with 2-meter radios, "but I would have the last word on any deployments necessary." For a California ARES Hospital Communications Group, it gets real after participating in a major statewide medical drill -- The 2016 Statewide Medical and Health Exercise took place on November 17 and was scarecely over for a month when the Hospital Disaster Support Communications System (HDSCS), a specialized ARES group in Orange County, California, was called out for the real thing. On Monday, December 12, around 1:15 PM, phones went down at Anaheim Global Medical Center. In accordance with the hospital emergency plan, HDSCS was contacted using the HDSCS Call-Up sheet. The hospital's assistant disaster coordinator informed the HDSCS contact of the problem and the request for multiple operators to back-up communications. A call over a local repeater used by HDSCS yielded two operators ready to put the system into action. Within a few minutes a base station was established and a lead communicator was on his way to the hospital. The base station and an assistant emergency coordinator made calls using the HDSCS "first wave" sheet. Over the next 15 minutes another three operators were identified and began their responses to the hospital. An additional three operators were contacted in case more would be needed and indicated their availability. As the first operator arrived, a hospital command center had been established. In under an hour, four communicators were on site with one operator staying in contact with the base station and the other three backing up internal communications. Training in Hospital Incident Command System protocols was helpful for the radio operators in working with the 213 and 214 ICS forms and the hospital staff knowing about the job action sheet preferred by Orange County hospitals. While this facility did have a back up phone system that provided some coverage for the most critical departments and some hand-held radios, the radio amateurs were wanted also: while some patient care staff could make a call on a hand-held radio, they couldn't always listen and preferred the HDSCS operators to handle communications. In this article I share both my experience with designing a versatile go-box, as well as my operating experiences outside of the shack. Consider the variety of locations you would like to operate from and let this project inspire you to enjoy similar experiences and convenience. Having participated in many field day events, as well as serving in various emergency/disaster communications response roles, I can attest to the benefit of having all the critical components conveniently pre-wired in one place. There is an added benefit to quickly adjust between diverse environments such as home, portable, and mobile operations without the hassle of installing and uninstalling radio equipment. 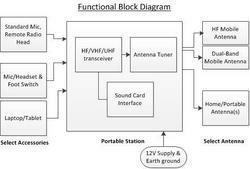 Being a requirements engineer, I applied a systems approach to this project with the goals of developing a go-box that would be capable of HF, VHF, and UHF operation; easily transformed between a portable, mobile/rover, or home operating environment; usable for digital modes, using a sound card device and software where possible; lightweight enough to carry (e.g., through an airport terminal); and small enough for aircraft carry-on (i.e., 22x15x9). It was important for me to maximize the capabilities of my station while minimizing the weight and ensuring simplicity. The main focus was on packaging the three basic components of a station: transceiver, antenna tuner, and sound card interface. At the same time, a decision was made not to include a power supply, but rather rely on various power options that were particular to the environment I would be operating in, thus saving on total weight. packaged and pre-wired together in the go-box. Depending on the chosen operating environment, the user may substitute various accessories and antenna(s) as needed. Note: For safety and convenience, especially in a mobile environment, I recommend using a radio that has remote-head capabilities. After some trial and error, I selected the MTM Case-Gard's sportsman utility dry (SPUD) box, specifically, the SPUD-2 model, as it has a comfortable carrying handle and provides enough depth, strength, and support needed to handle the weight of the radio gear. as seen in Figure 2. A small Anderson Powerpole junction box simplifies wiring. The total weight of this packaged solution is less than 17 pounds. Below are typical operating environments and special uses where you can safely and effectively operate the station. You should consider how many of these environments apply to your particular needs before designing your own packaged solution. A fully featured system that can be used with a power supply, an antenna, and power for the computer. A limited set of functions on HF/VHF/UHF with a remote head for driver safety and convenience. 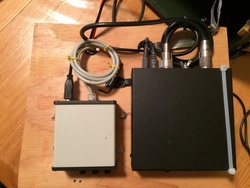 Add a headset and foot switch, and laptop computer, and it is ready for contest logging, DX Spotting, and digital sound card modes. The sound card interface can also act as a digital voice-keyer, saving you from calling CQ for hours on end. Perfect for quick setup, a quick-deploy NVIS antenna, and VHF vertical antenna for operating HF, VHF, or the popular e-mail over radio software such as Winlink Express. Since many of the sensitive components are packaged securely, it is possible to operate this in a marine environment as well - consider harsh environments when designing your go-box. Bolts/nuts are best for installation, but Velcro should be sufficient for smaller components. Another option is to tie wrap components on to sanded plywood for good results. Mount radio on lower portion of box, using rubber feet to raise angle of radio for less strain when using controls. Put less-used materials on the top shelf. 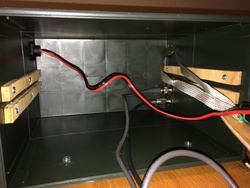 When mounting SO-239 connectors through the case, use star washers to keep the connectors in place. As a convenience, add an external speaker, volt meter, USB port to charge small devices, and a dual-band DB-J2 roll-up antenna. Consider adding a manual or guide for your radio or create your own document for nontraditional (set and forget) settings (i.e., port speed for radio to computer communications, operating various digital modes software, and preferred audio settings for each). Print the document on laminated paper to fit neatly into the go-box. Don't forget to label all connectors. Also, print labels with your name and call sign inside the box and cover. 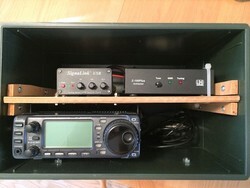 If you wish to use the go-box as a mobile rig, the radio should have remote-head capability. Mounting the head unit remotely will provide additional space inside the box. The go-box fits the aircraft carry-on bag size requirements; however, consider what you store in the case as there is an ever-growing list of prohibited items that cannot be transported on a commercial flight. accessing the components. Optional internal fused circuits for protection, or a small fan for cooling that may be needed during mobile operation, are not shown. reducing arm muscle strain when in operation. Note, in Figure 4, there is a 1½" hole in the top shelf for passing wires through the shelf to the bottom of the go-box. The bottom shelf is mainly for the radio with storage space for remote head or other accessories. 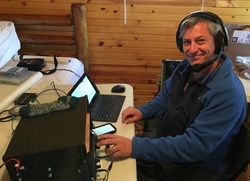 The author, Paul Lusardi, N0VLR, participating in the 2016 Pennsylvania QSO Party (photo credit N3FB). Pennsylvania QSO Party, I used a Heil headset, foot switch, and tablet computer. I was surprised that with running pileups for two hours straight, the heat dissipation from the go-box was sufficient and no additional fans were required. The N1MM contesting software allowed sending digital voice recordings through SignaLink, which worked very well. The only additional piece of equipment I needed was a small folding table to hold the go-box, my computer, and I still had ample room for food and drink! All of us who have had even minimal experience at the scene of any form of disaster, man-made or natural, know just how rapidly things can change in that environment. We have our "go bags" ready for what we believe we will need to get us through the situation/deployment. But have we given any thought about what would happen if, during our deployment, something were to happen to us, both on a minor scale and a larger scale? For the minor scale issues, I suggest what I call a personal comfort pack. This would include items such as pain killers, cough drops, Antacid, lip balm, sun screen, any prescription drugs you may need, a few Band-Aids®, a few granola or power bars, and anything else you think may make your deployment a little easier and more comfortable for you, such as eye drops if you wear contact lenses. pouch you could always go bigger. Popular now in some sporting goods stores are the plastic military style "ammo cans." These would also be a good choice for your personal comfort kit. They are inexpensive, light weight and have a rubber gasket around the lid to give it some degree of water resistance. These "cans" can even hold a bottle of water if you wanted one. Now that you have taken care of the little things, what can you do to help yourself if something more serious happened to you during your deployment and you were unable to communicate? Most Emergency Medical Technicians are used to looking at a person's wrist or neck for a medic alert bracelet or necklace, so I got a very small brightly colored flash drive and labeled it on both sides, "Mike B. MEDICAL." Since there are laptops everywhere now, from mobile data terminals (MDT's) in the squad emergency transport vehicles to the desks in the trauma center, you can communicate a great deal of information without being conscious by having it readily available on the little flash drive. On mine, I have the following: Page one has my name, address, home phone and date of birth. It also lists the names and cell phone numbers of my wife and daughters. At the bottom, in red and in all caps, I have listed no allergies and my blood type. The next few pages list my personal medical history to include the type of medical incident (broken bones, surgeries, etc.) the attending physician's name, the date and location of treatment. After that I have a sheet with a copy of the labels of all prescription medications I am currently on. This gives the hospital the type of medication, dose, and the name of the physician who prescribed it. Next I have a page that has a copy of all my doctor's business cards, from my family doctor to a specialist, my dentist and even my optometrist. I provide this so that if a trauma center or ER doctor has a specific question, he/she can contact my doctor directly. Lastly I provide a page of family medical history. Depending on what has happened to you, this information could be very important. You might say, well I have a card in my wallet with my spouse's contact information -- they can just call him/her and get the information needed, and you would be correct, they could. However, in some medical situations, time is of the essence and if they had any difficulty contacting your spouse, they are using up critical time. In addition to providing radio communications in support of public safety and security at the Republican National Convention in July, the ARRL Ohio section doubled its involvement in public events and incidents over the activity of the previous year. Section Emergency Coordinator Stan Broadway, N8BHL, credited his team of local and District Emergency Coordinators for their participation in long planning meetings, intense preparations and successful operations. Ohio ARES solidified its relationships with numerous emergency management agencies and Red Cross offices over the course of the busy year. The number of Ohio ARES members completing FEMA IS-100, 200, 700 and 800 courses steadily increased: a database shows more than 500 ARES members now holding 3,263 course certificates. In Ohio, ARES volunteers who report to an EOC or incident field operation must hold the NIMS/ICS course completion certificates. Some Ohio groups are developing MESH (2.4 GHz) digital networking systems while others are working on applications in Winlink, the hybrid Internet/RF-based email system. In several counties, ARES organizations are upgrading, expanding and developing stations in their local EOCs. The Ohio state EOC station is being fitted with all new radio equipment -- the remodeling and installation is expected to be completed before the end of the year. Many other groups were busy upgrading communications trailers for emergency/disaster response, some in cooperation with CERT programs. ARES members again participated in Ohio's NVIS Antenna Day, testing the ability to communicate within the state using HF radio frequencies. In 2015, ARES members participated in their first ARES VHF Contest, designed to test and improve local communication capabilities for those times when all else, including repeaters, fails. The next Ohio ARES VHF Contest will be held on January 14. SEC Broadway said about the year, "From bringing aid to a stricken hunter outside of cell phone range to being a standing backup during the RNC, to activating to help at an EOC, our ARES volunteers won the confidence of EMA directors, and assumed a higher position of trust."